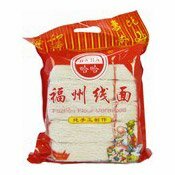 Description: Jazz Fuzhou Flour Vermicelli is a natural special food of Fuzhou, which is names Lucky Vermicelli or Long Life Vermicelli. It is adopted high-quality flour and smooth, as pure as jade, nourishing and digestible. It wishes good health and a long life it is good for entertaining guests as well as a gift. 2. Put the Fuzhou Flour Vermicelli in boiling water and stir it. 3. Take it up in half a minute and put it in flavoured soup, edible. 1. Fry vegetables, meat or fish or shrimps together with onion or garlic first. 2. Boil the above in flavoured soup for 2-3 minutes. 3. Put in the Fuzhou Flour Vermicelli, boil it for 1-2 minutes. 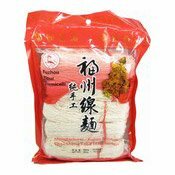 Simply enter your details below and we will send you an e-mail when “Fuzhou Flour Vermicelli (爵士福州線麵)” is back in stock!